A special concert which deserves a special sort of review. It begins with a list of blue links above, taken from the useful two-page programme sheets distributed free at the concert - no ploughing through pages of glossy advertisements to get to what you want, as with the costly programme books at London's major venues... Click onto each of them and you will speedily be well informed about the composers and artists; this fits well with Musical Pointers' policy from its launch, to celebrate the glory of the www by supplementing reports with hyperlinks. The elegant card illustrated features a world premiere by Bushra El-Turk, whose marionette opened the second half, and I begin there for an additional reason which will emerge. A new name to me, this GuildhallSMD graduate has an impressive CV and I shall be looking out for more examples of her "ironic and allegorical musical vocabulary". Bushra's marionette struggles against destructive doctrines, with the vocalising-flautist voicing No! in Lebanese insistently. An arresting piece which should be widely taken up by 21st C flautists. Heard from the right side of the hall, directly facing the fully open piano lid, the impact of voice and piano was powerful and perfectly balanced. And it was good to see the eye contact and close rapport between these artists - how often are world premiere duo performances given by memory? Une Marionette Desincarnée heralded a great hour of music making, which continued with Honami by the distinguished flutist/composer Wil Offermans, a flute solo depicting the waving of rice plants in the wind, with extended techniques and a preponderant focus on the sounds of breathing; interesting for we afficionados of the shakuhachi. Completely persuasive, indeed riveting, was Honami *** - as indeed so was Boustany throughout the evening, his playing commanding rapt, silent listening by an audience with a large contingent of London's Lebanese residents, there to support a Conflict Resolution teaching programme in their troubled home country. And finally in the published programme a sonata of York Bowen - the second to be heard in a fortnight by this once popular composer in whom there is currently a resurgence of interest. * A well crafted romantic work, it came across as a true duo, with the virtuosic piano part relished by Aleks Szram (previously reviewed in Musical Pointers and one of our most valued contributors) and bringing the scheduled concert to an end with an ovation from the large audience. Followed, in Beechamesque 'lollipop' vein, by the contrasting La Cygne from Le Carnaval des Animaux as the perfect quiet encore. Duo recitals usually involve a third musician, the page-turner, who can at preliminary-runs through discharge an invaluable extra duty in the venue (I attended a rehearsal at Wigmore Hall of the Takacs Quartet, whose members took turns to listen down in the hall whilst the other three worked at particular passages...). It is highly desirable to have someone listening in the body of the hall to advise upon balance from the audience perspective. The difference between the experience left and right at St John's last night was disconcerting and revelatory. 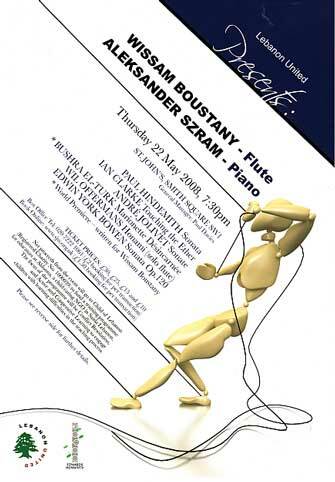 Perhaps all will be resolved in a CD of this splendid concert programme by Boustany and Szram, both of whom teach at London's Trinity School of Music? Some final thoughts about this concert being advertised with "BOTH playing from memory"! ** That this has advantages was shown clearly in the extra rapport between Szram & Boustany, but for a busy pianist to do so is a time-demanding constraint (at a recent Messiaen concert at Wilton's, Peter Sheppard drew the audience's attention to the disproportion between the huge demands upon the pianist - quite apart from memorising - as against the single lines of his colleagues...). A pleasant recital, but not so interesting a programme as this established duo gave us in their last London concert in 2008 (above). 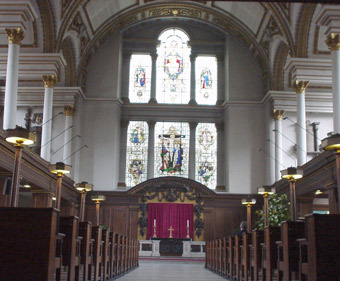 St. James is right on Piccadilly, but it is possible to "filter out" traffic noise; not so, however, the aural confusion caused by this distinguished church's eleven barrel vaults, reflections from the high central one over the nave lethal for listening to music. Mozart's little sonata from his juvenilia was intolerable from one of the "best" seats near the front, the sound there disturbingly confused. After the first movement I fled to the right side aisle under the gallery where, as past experience had taught me, the sound clarified, and for the rest of the programme the music was well heard and balance was good (it should be axiomatic for critics to declare where they sit in concert halls and opera houses, so various are listening experiences). Dutilleux's well known sonatine was given a confident performance; Taktakishviill's sonata (he was the composer of Georgia's national anthem), if not a neglected masterpiece, was good to have heard once. 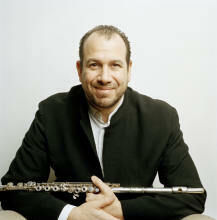 Wissam Boustany's unaccompanied first composition "moulded from improvisations" was a fine demonstration of his skills. He introduced it with an impassioned declaration of his anti-nationalism and anti-religions stance, both types of loyalties engendering human division and conflict. The wind, in Boustany's metaphor for a better world, "never shows its passport when it crosses a border...". Fauré's 1st violin sonata went well on flute, less problematically so than sometimes can be Prokofiev's Op 94, which has rather been taken over by violinists. Boustany showed signs of tiredness before the end, and sensibly gave just one short encore. Aleks Szram however was imperturbable at the piano and always in close rapport with the soloist. His playing this whole recital by memory (as in 2008) was a quite extraordinary achievement. I hope there is a CD from them in the pipe-line or, better, one derived from each of these notable recitals. 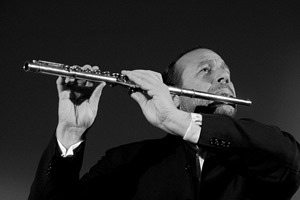 IMPROVISATION is the purest form of self-expression that a musician can attain. structuring and developing consistency and discipline in one's playing. 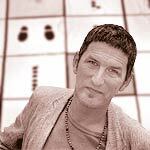 ideal musician stands on, in his/her search for beauty, intensity, consistency and fluency. and that influences the direction and evolution of the improvisation as it goes along. otherwise we are building a temple of dysfunction with ourselves. Improvisation leads you on an adventurous journey inwards.